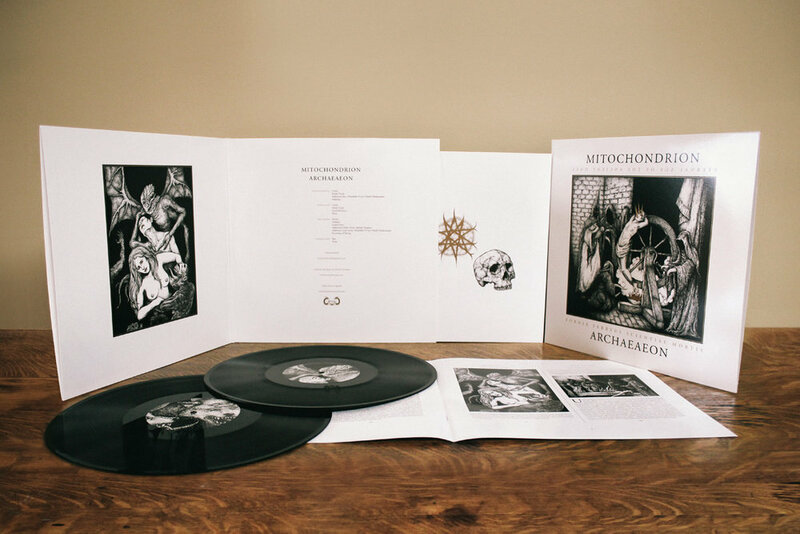 Perhaps one of Vancouver’s most reputable exteme metal acts, Mitochondrion’s compositions are a force to be reckoned with. Though their debut LP, Archaeaeon, was initially released independently on CD in 2008, the band’s current label, Dark Descent Records decided to reissue the album on vinyl in 2012. This commission involved revamping the layout and providing all new artwork, whilst maintaining the “old manuscript” mood of the original release. The result is a sophisticated, yet disturbing design wrought in stark black ink against a blinding white stock with highlights and splashes of gold ink.